we decided to insulate the floor with a mixture of hard foam to fill the gaps between the ridges and a layer of reflectix to help out a bit too. we removed the seats, used the carpet and some measurements to figure out the shape of the project and as our stencil. we cut some plywood and relectix to size, then glued the hard foam and wooden struts that were cut to support the plywood subfloor down with great stuff. then came the 3/4" plywood subfloor, stained to help keep it from warping in any moist environments and screwed into the wood struts we glued down in the previous step. next we glued a faux wood vinyl sheet to the plywood and the edges were sealed with caulk. the wheel arches are just wrapped in reflectix, but they are now covered by the sleeping platform, so not too much of an eye sore. 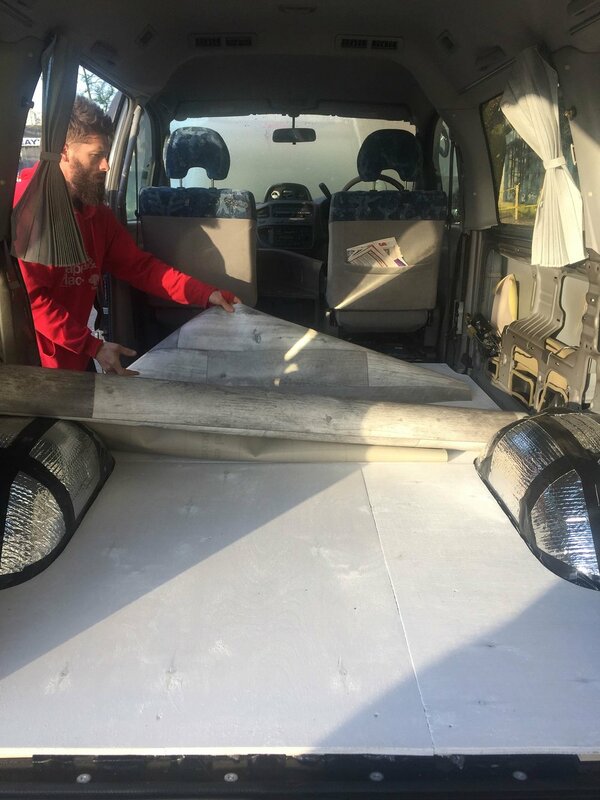 we chose to insulate the rest of the walls/ceiling of the van with 3M thinsulate SM 600L sound thermal insulation engineered for vehicles. we like the non-toxic and mold-resistant properties, and figure we wouldn't go too crazy with insulation since we still have most of our windows (some will be vinyl covered) and that's where we'll have the majority of our heat loss and gain. we ordered 15 linear ft. from hein in oregon, and started cutting, stuffing and gluing. we've taken a break from areas not behind the platform until we get the electrical installed in case we need access to any of the inner panels.